The annual Baseball Hall of Fame elections are popular topics for hot stove discussions across the country. Currently, the Eras Committee (formerly the Veterans Committee) is debating the merits of those whose careers peaked after the late 1980s. While Gil Hodges is not eligible for this current vote, the mere mention of any Hall of Fame committee meeting is still a hot button issue for many baseball fans. Fred Valentine should know a thing or two about Hodges’ Hall of Fame worthiness. He played under Hodges for four seasons (1964-67) with the Washington Senators and recently sat down with Baseball Happenings at the Firefighters Charitable Foundation Dinner in Long Island to express support for his fallen manager. While Valentine’s hustling spirit resonated with Hodges, he suggested that his leader’s stoicism might have contributed to his early demise. 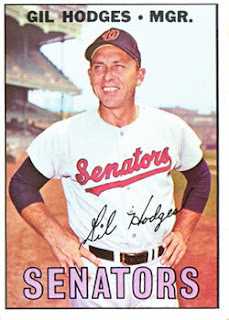 He said too often, Hodges would bottle up his emotions when players made boneheaded plays, and on those 1960s Senators teams, they were aplenty.